Terrifically acted, superbly written and masterfully directed by the Coen Brothers, this is an incredibly suspenseful thriller that looks set for Oscar glory come February. Based on the novel by Cormac McCarthy, No Country For Old Men stars Josh Brolin (sporting the same moustache he's had in his last four films) as Llewelyn Moss, a loser who stumbles onto the scene of a drug deal gone horribly wrong in the Texas desert. He duly makes off with the drug money, unaware that vicious killer Anton Chigurh (Javier Bardem with a comically awful hairdo) is on his trail and will stop at nothing to get the money back. When Moss eventually realises how much trouble he's in, he sends his wife (Kelly Macdonald) into hiding, while desperately trying to stay one step ahead of the murderous Chigurh. Meanwhile, Sheriff Bell (Tommy Lee Jones) doggedly pursues both men and discovers that he may well be out of his depth. This is a welcome return to form for the Coen Brothers after the twin disappointments of Intolerable Cruelty and The Ladykillers. In terms of their previous films, No Country is like a stripped down version of Fargo with the idiosyncratic character-based comedy surgically removed and the suspense cranked up to eleven. Bardem delivers a genuinely chilling performance as Chigurh (particularly when giving his unwitting victims a sporting chance to survive), while Brolin gives a terrifically noir-ish portrayal of a man trying to escape his fate and Jones is genuinely moving as the Sheriff. There's also a superb cameo by Woody Harrelson as a straight-talking bounty hunter and Kelly MacDonald adds a heart-breaking note of sweetness (and nails the Texan accent) as Moss' wife, Carla Jean. The film is also beautifully shot by the Coens' regular cinematographer Roger Deakins and the various suspense sequences (particularly one involving a dog) are both brilliantly directed and heart-stoppingly tense. 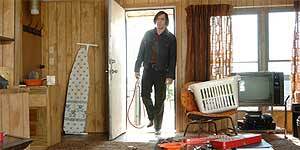 No Country For Old Men is a gripping, powerful and ultimately devastating thriller that may well be the Coens' masterpiece. It is also, unquestionably, one of the best films of the year.